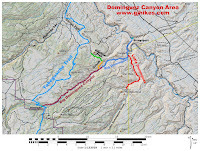 The Dominguez Canyon Cutoff trail is located in the Dominguez Canyon Wilderness Area near Grand Junction, Colorado. The upper end of the trail begins on the canyons rim at the end of the Dominguez Canyon Overlook trail. From there it steps its way into Big Dominguez Canyon along several benches before finally descending the loose hillside of a slide and coming to an end at the Big Dominguez Canyon trail roughly midway between the Bridgeport and Dominguez Campground trailheads. 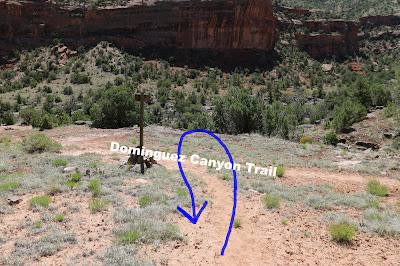 To get to where the upper end of the trail begins follow the directions to the Dominguez Canyon Overlook. Look for a trail marker on the west side of the overlook. Before this area received its wilderness designation it was possible to drive to this point on an old jeep road. The trail starts out heading west below the top of the mountain on a lateral line. The stunning views of the canyon far below might be a distraction to staying on the trail. The trail is pretty much baked into the ground but with little use it can become sketchy in places. Paying close attention to the cairns along the way should assure staying on the proper route. 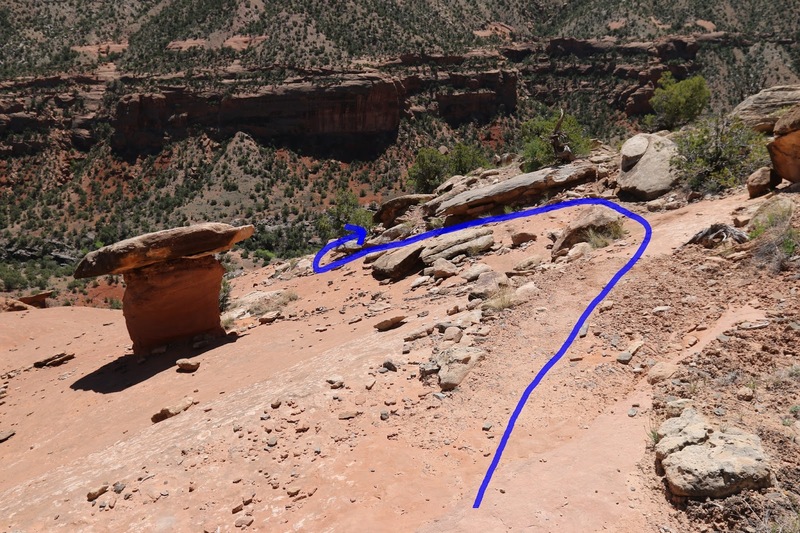 Just past the 3/4 mile point the trail drops off the current bench that it has been following passing through a gap that was left from a chunk of the cliff that had broken away. If you sit on your bum and dangle your legs over the side you will seen that the maneuver is much easier than it might first appear. After dropping down to the next bench the trail continues much the same as before. As the trail reaches an area of red slickrock with a cute little hoodoo pay close attention to the cairns to avoid some difficult down climbing. The correct route skirts the edge of the red slickrock. The trail continues sloping downward as it comes around the mountain where a huge gnarly looking hoodoo comes into view. The hoodoo is capped by a large slab of rock that looks like might be Dakota sandstone. The cap rock is allowing the hoodoo to erode away at a slower pace than it otherwise would. The last couple hundred yards of the trail descends a rocky slope of fill that has sloughed into the canyon. Trekking poles might make it easier to get good footing. 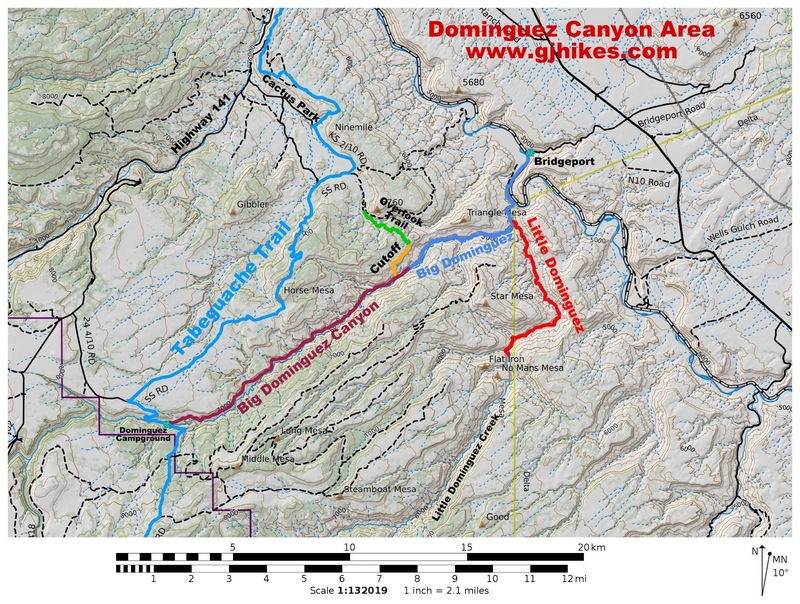 The trail comes to an end when it reaches the Dominguez Canyon trail. The Dominguez Campground is about 9 miles up the canyon to the right and the Bridgeport trailhead is about 8 miles or so down the canyon to the left. Just off the trail to the left is a primitive campsite. About 1 mile down the canyon there is an abandoned copper mine. There are quite a few petroglyph sites in Big Dominguez Canyon beginning near the mine and continuing until about 4 miles or so before reaching the Bridgeport trailhead. Hiking back up the slide can be much faster than going down it with footing easier to obtain in that direction. Once you make it above the big hoodoo the rest of the trail is more moderate. There are no cliffs or dropoffs that the trail gets close enough to for any concern. There is a nice primitive campsite a short distance to the east from the overlook that is nestled out of view in the rocks along the rim where the lower area of the canyon and Triangle Mesa are within full view. It is a little over 2 miles from here to the trailhead in Cactus Park so if you include that portion into the round trip distance it will come out to about 7 miles. Backpacker can spread the distance out over several days of course. If you would like to see it for yourself then all you have to do is 'Take a hike'.